The weather did a quick flip-flop this past weekend going from the persistent damp gray of Faugust to excessive heat warnings. Fortunately for me the worst of the heat is oppressing areas further inland but it's been hot enough to slow me down. Here's the first pepper of the year, harvested before fully ripe to foil the rodents. I can't say that I've been managing to do that with the tomatoes in spite of deploying a couple of dozen rat and mice traps in the garden every night (except last night, I hope the damage isn't too bad). The best of the alliums this year were the Zebrune Shallots, they seem to have recovered more easily from the Downy Mildew and gone on to produce a range of sizes of bulbs, some of them very large. I got a few seeds of a bean that is very popular in the Central Valley area, an heirloom called Baciccia. There's only 6 plants that survived so I picked a few to sample and I'll allow the rest of the beans to mature so that I can save the seeds which are nearly impossible to find. Otherwise the bean harvests have been the same as last week. The spring planting of Broccolini continues to pop a modest but adequate number of side shoots. And I continue to harvest a few cucumbers here and there. Those couple of Chelsea Prize cukes were not show stoppers but they were fine sliced up to make a smashed cucumber salad along with their basket mates. The Romanesco zucchini plant shows no sign of slowing down production although it is sporting more signs of powdery mildew. And there's no shortage of Batavia broccoli either. The four plants that were the winter producers and the three surviving plants that were the spring producers haven't been slowed down by "summer" weather. With June Gloom, No Sky July, and Faugust being the norm I guess that's no surprise. I've been pretty good at keeping on top of the Tromba D'Albenga harvests but the plants are so overgrown now that I didn't spot that one until it was pushing it's way out of the jungle. At 5 1/2 pounds it was big enough to make a batch of Zucchini Sott'Olio so that was its fate. Nothing new and creative on the cooking side of things. It's hard to get motivated to do any ambitious cooking when half the contents of my kitchen, pantry, and laundry room are still scattered around the living and dining rooms. Progress on the kitchen upgrades has slowed to a crawl but I think the end is finally in sight. It's time for a summer garden tour before summer is gone! First a couple of big overview shots from the hillside above the garden. You may notice the newest garden defense that I recently installed - 1/4-inch hardware cloth surrounding the entire garden for rabbit deterrence. There's rabbits all over the place this year and they love the goodies in my garden. I wish the mesh was effective at blocking rodents as well but those pests always find a way in. Bed #1 is home to tomatoes and peppers. The plants are big and as healthy looking as they can be. I train the tomatoes up a remesh trellis, trimming off excess shoots and a lot of leaves as I do so. Some of the plants are susceptible to foliar diseases and I try to remove as many of the old and sick leaves as I can. I think that removing a lot of foliage keeps diseases from spreading more quickly and the better air circulation keeps the newer leaves healthier. All the trimming certainly doesn't seem to slow the plants down. The plants are in desperate need of another round of trimming and training. There are lots of peppers that have set on the plants but only one is showing signs of ripening so far, Petite Marseillaise is fairly large, thin fleshed, yellow and sweet. This is one of the few that I got to enjoy last year before the rodents attacked. Violet Sparkle starts out bright green, then turns purple, and finally ripens red. It is a sweet pepper that I tried for the first time last year and I got to enjoy 1 pepper that ripened in the garden. Last year a lot of peppers succumbed to the gnawing jaws of rodents and/or rabbits just as they started to ripen. It got to the point where I ripped out most of the sweet pepper plants before I got to enjoy any ripe ones, it was actually preferable to toss the pepper covered plants into the compost than to feed the beasts. I'm just paranoid that I may go through the same experience this year. So here's my weapons of choice when battling rodents - good old fashioned snap traps. I have found that it helps to make the bait hard to get to so I secure the bait to the paddle with some adhesive tape. I'm hoping to be able to keep a few select plants safe from the rodents by keeping them enclosed in individual cages made of 1/4-inch hardware cloth. The only plants that are enclosed though are the ones that I want to save seeds from which is why the cages are currently covered with fine mesh as well. As soon as the plants started to pop some blossoms I added the fabric mesh to keep pollinators out. A lot of peppers have set on the plants and some of them are trying to burst out of the tops of the cages so it is time to remove the fabric. Some of the squash vines in Bed #4 are threatening to block the center path. I keep directing them along the side of the path as they try to grow across it. That's Kurin Kabocha squash on the trellis at the end of the bed. It has set a few squash and is still blooming and setting new squash. 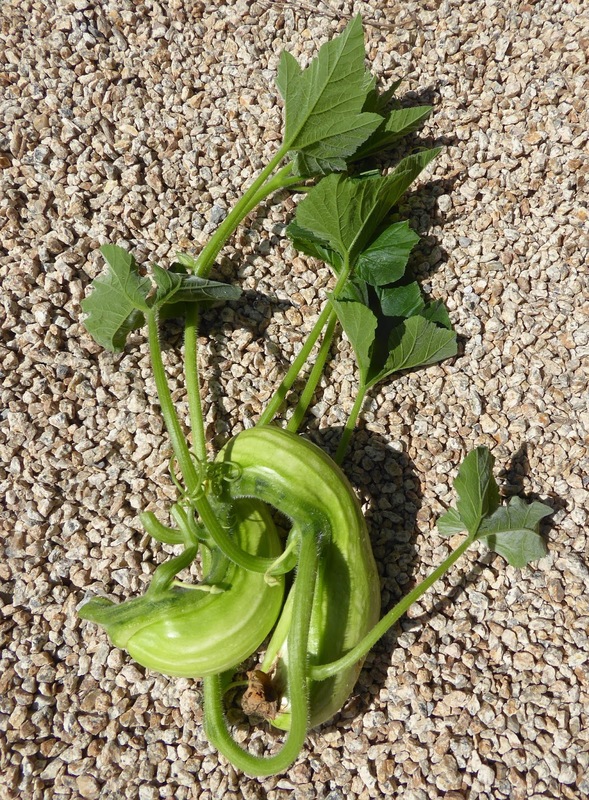 Next in the bed is the sprawling Terremoto squash. It is growing all over the place! It too has set some squash. I trained 2 Tromba D'Albenga vines up another trellis and they quickly engulfed it and have now started to take over the center path. I keep cutting it back so that it won't overwhelm the cucumbers growing on the adjacent trellis. The cucumbers have engulfed the Persian Basil in the corner of the bed and are groping for the neighboring Corsican Basil. The basil needs a hard trim! Bed #2 is home to 3 varieties of flour corn and 3 varieties of dried beans, and 4 varieties of snap beans. One corner of the bed also has a few pepper plants that came back from last year which I had intended to move but never got around to. In the foreground is a stand of rabbit trimmed Cilician parsley. The Baby Aji Amarillo and Mareko Fana plants have come back incredibly well and have set a number of peppers but the 2 Aji Amarillo Grande plants are sulking. Another corner of the bed is where I've been experimenting with growing cilantro in succession plantings. There's 6 short rows, each row planted about 11 to 14 days apart. I just sowed the 8th succession the other day. It's working pretty well so far, I'm not getting huge amounts of cilantro but am able to harvest a small bunch every few days which is enough to keep me happy. Batavia has become my favorite variety of broccoli. I've been growing it for at least a couple of years, maybe more but I can't remember and I'm too lazy to check my records at the moment. I consistently produces good main heads and then a long series of side shoots. Every time I think it's on the verge of giving out it starts to pop out a bunch of new side shoots and not just piddly little ones. 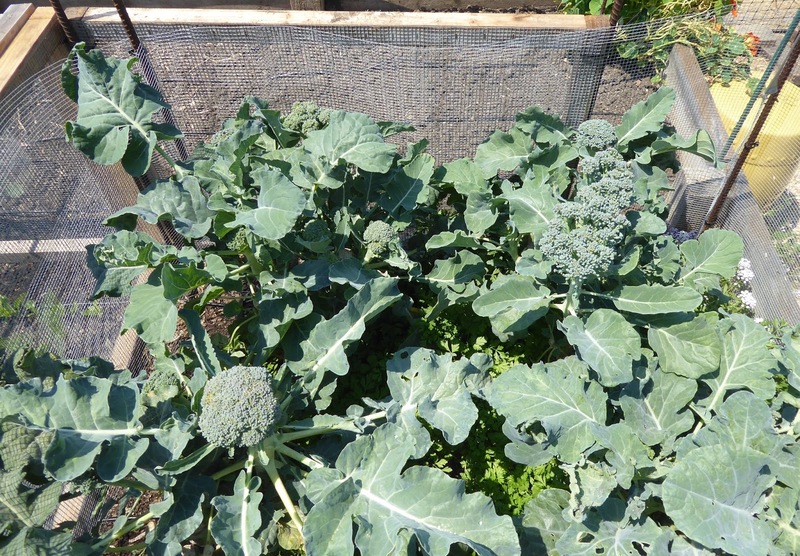 That's the patch of broccoli that I grew for winter harvests and it's still growing strong. One of the newest additions to the garden is a few rows of greens that are meant to harvest as babies. The biggest plants are Ethiopian Highland Kale (actually a mustard), in the center is Baby Tuscan Kale and the other greens are Special Baby Leaf Chard. Various carrots for fall harvests are further down the bed. Between the greens and the carrots is a patch where I sowed some old parsnip seeds that failed to germinate. I sowed fresh seed the other day, it's a bit late for parsnips but with our long mild fall I hope to get away with it. 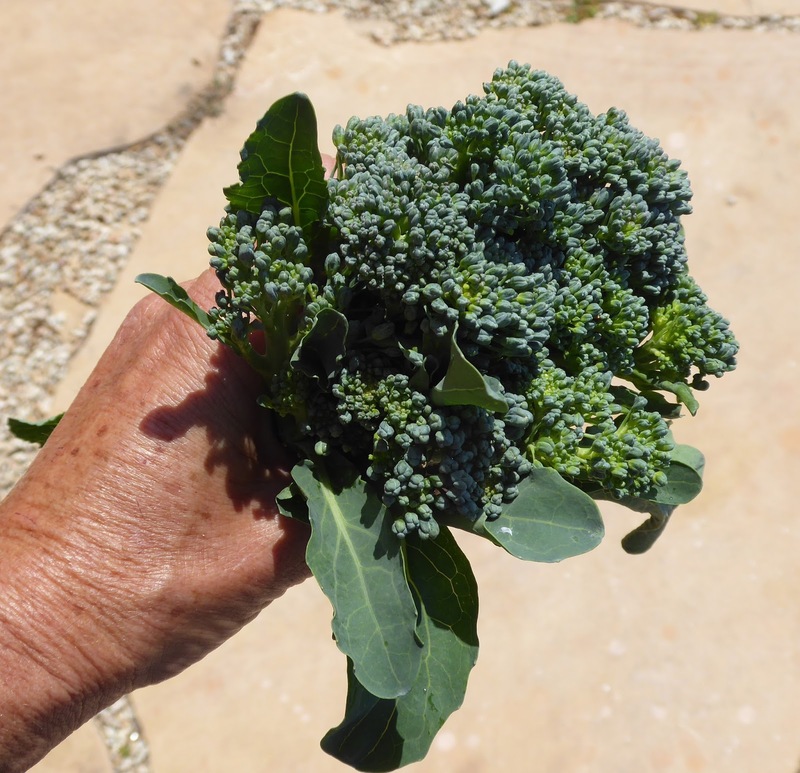 The spring sowing of Aspabroc (aka Broccolini) keeps on giving. 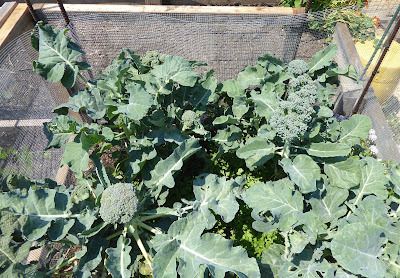 The spring sowing of Batavia broccoli had a setback when rodents or the rabbit got into the cage (my fault because I left it open for a while) and gnawed off the developing side shoots. 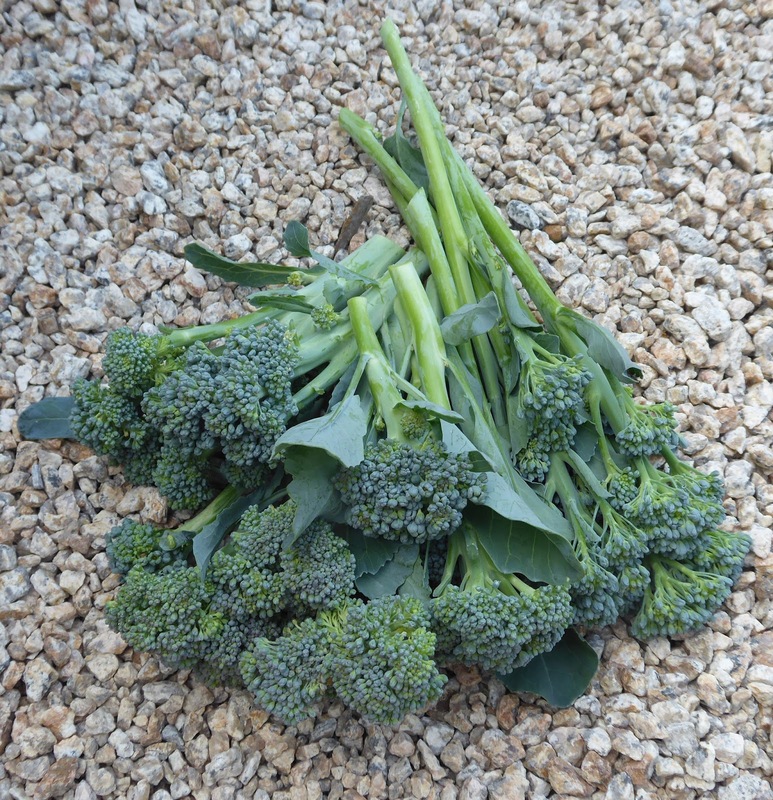 I think it is recovering but the loss wasn't too badly felt since the older broccoli plants never gave up producing. My patch of Pink Plume celery is growing so slowly that I've not harvested anything yet. The Brussels sprouts are growing quickly though. I'm growing only Gustus this season. Last year I tried Hestia also and they were ok but Gustus produced better sprouts. Beyond the Brussels sprouts are the newest addition to the fall/winter lineup and then beyond that are newly planted out Broccolini and Fioretto Stick Caulifower seedlings. Kalettes are a cross between Brussels sprouts and kale and produce frilly purple tinged sprouts. They start off looking like the kale side of the family but are supposed to grow tall and produce the sprouts on a stalk like Brussels sprouts. Did you see my Harvest Monday post last week? Guess what, this week looks a lot like last week with the exceptions of a new variety of cucumber and no wasp photo, although I did "harvest" another half gallon of dead Western Yellow Jacket wasps. If you follow me on Instagram you can see plenty of wasp pics and a couple of videos there. That's the first Gagon cucumber of the year. I grew them last year but ripped out the plants because the cucumbers were entirely extremely bitter. After I ripped out the plants I found that the young cucumbers that were on the plant weren't actually bitter so I decided to try them again this year. That first one got away from me and got to be huge so I was afraid it might be bitter. The first inch at the stem end was bitter but the rest of it was quite good. Last year I figured out that the bitterness was caused by the plant being under water stress, the corner of the bed where the cucumbers were growing was being invaded by oak tree roots which were sucking up a lot of water. It wasn't only the cucumbers that suffered, the usually hyper-productive Romanesco zucchini that was growing in that end of the bed was also under-performing. 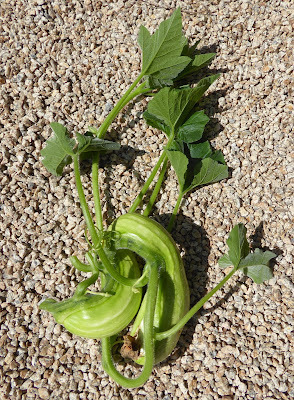 The Romanesco zucchini is back to its usual hyper-productivity this year and the Tromba vines are trying to catch up. Production so far is 36 pounds of Romanesco and 26 pounds of Tromba. Last night I made another variation of a grilled zucchini dish that is becoming a favorite. I grilled a few of the Tromba squash, I like to cut them into about 6-inch lengths the split those lengthwise. Once grilled I arrange them on a platter and top them with a sauce of sautéed ground meat (lamb this time), onion, maybe garlic, chopped dried sweet peppers (because I don't have fresh ripe ones yet), maybe spicy pepper flakes, a spice blend or single spice which was simply cumin this time, I also added toasted pine nuts this time, and that is all simmered in tomato puree (still using last year's freezer stash) and then finished with pomegranate molasses and chopped cilantro. I thought that last night's variation came out particularly good. Oh wait, last week I didn't show any broccoli or broccolini, this week there's both. And there's some Rolande filet beans and one Amethyst Purple filet bean to accompany the Roc D'Or beans. There would have been more tomatoes but the rodents have started in on them. Grrrrr. 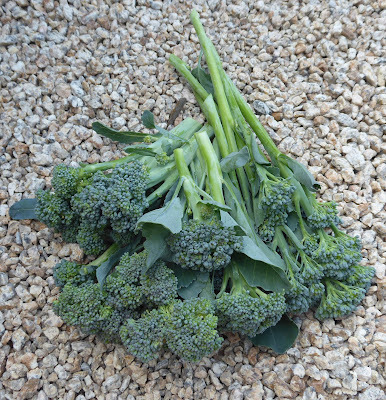 The Batavia broccoli plants that produced through the winter and spring are still putting out side shoots. The spring sown plants got gnawed by either a rodent or a rabbit or both so they are only now recovering and starting to put out some side shoots, they are those 2 good sized ones on the left. That's the latest from my garden, head on over to Our Happy Acres where Dave is hosting Harvest Monday, there's lots more beautiful harvests to be found there. It's been quite boring when it comes to harvests lately. Nothing new except for a very few Roc D'Or beans. 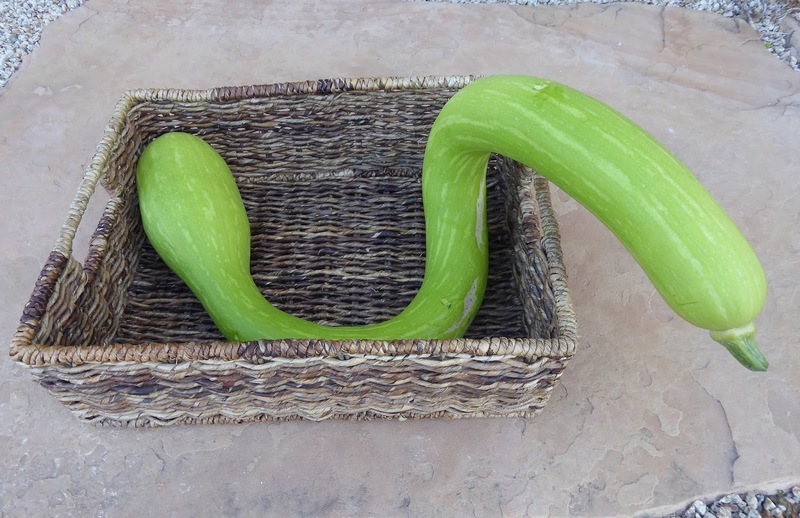 One wonky Tromba D'Albenga squash. There was loads more Romanesco zucchini and Tromba squash most of which I didn't bother to photograph. There were a few cucumbers here and there. And that's been it other than cilantro and basil. If you have a fear of stinging insects then you can leave right now. This is turning out to be a banner summer for Yellow Jacket wasps. A couple of months ago I hit a YJ nest when cutting down weeds. Four stings later I thought I had eliminated the nest. I put a few traps up around the area which netted just a few YJs and I thought I had things pretty well under control. A couple of weeks ago it started to become impossible to enjoy a meal outdoors without YJs zooming in after just a moment. I noticed that there was activity in the nest again. Then I noticed that there were YJs everywhere. Worker wasps were out foraging for food. That's when I got serious about setting traps. This morning, only 48 hours later, the traps have just about as many wasps in them again. Western Yellow Jacket wasps forage for live or dead insects, dead animals, and nectar. It's that dead animals and nectar that make them such nuisances around your outdoor meal - they want whatever protein, fat, or sugar you want to enjoy. They seem to be particularly drawn to fresh raw meat so that's what I've been baiting my traps with - plain old raw ground beef. It's a lot cheaper than the chemical baits that the traps come with. The only drawback to using ground beef is that the bait needs to be changed every 2 or 3 days because the YJs aren't attracted to rotting meat. But at the rate that the traps are filling up they need to be emptied about every 3 days anyway. One thing I learned about placing a trap is that the ones hanging in full sun have been the most attractive to the wasps. Traps that were hanging in the shade had very little activity. Normally I would just live and let live where YJs are concerned, they aren't usually that bad around here and they are beneficial insects providing pollination and pest control services. I suspect that they may be the reason why the garden is not plagued by too many aphids this year. But when it becomes impossible to enjoy a meal outside and I repeatedly get stung then I sting back. Hope your summer harvests are more varied and less hazardous than mine! 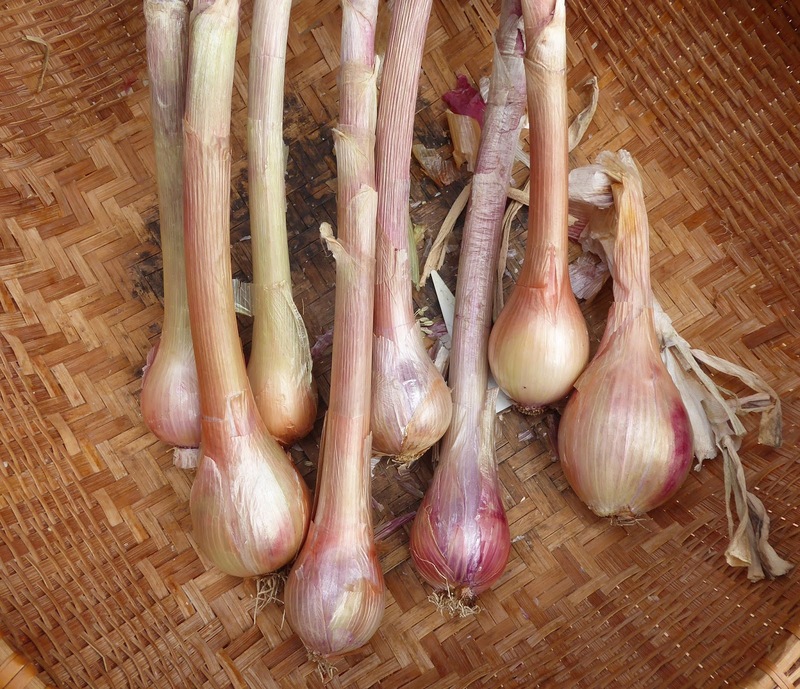 Harvest Monday is hosted by Dave on his blog Our Happy Acres, zip on over there to see what other garden bloggers have been harvesting lately. 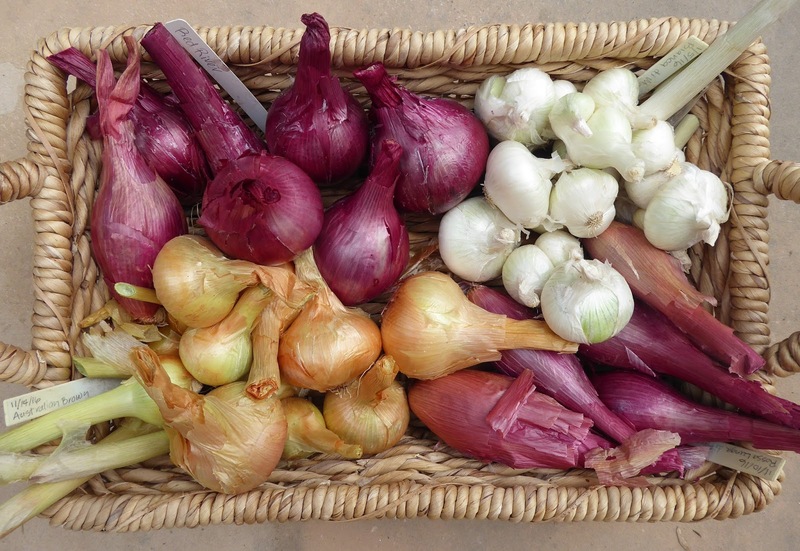 There's more of the "usual suspects" in the harvest basket this week, but first a parade of runty onions. Bronze D'Amposta was the worst of the lot, all but one of them bolted. 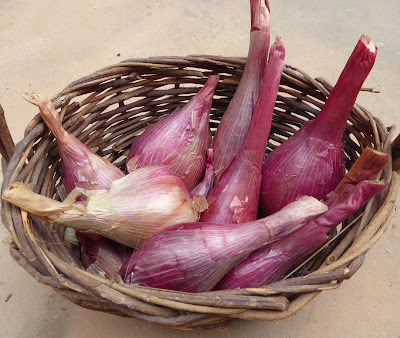 In spite of devoting more space than ever and growing more varieties than in past years I ended up with a much smaller total harvest of onions than in prior years. 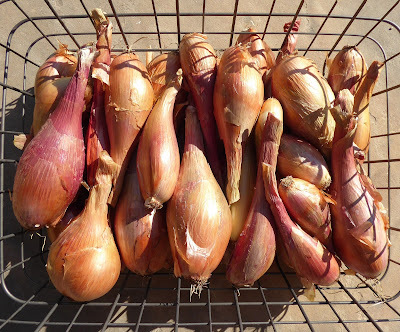 This year the total harvest, including spring and uncured onions was 51 pounds. 2016 was 86 pounds, 2015 was 141 pounds, 2014 was 93 pounds. Curse that downy mildew! Enough of the onions and on to the stars of the show for the week. The first and for a while the only big tomato. This one set while the young plants were enjoying the protection of a mini greenhouse before the plants were set out in the garden. I think it will be a few weeks before I harvest another large tomato. It was absolutely delicious paired up with some burrata and basil. We sampled the first ripe Green Bee cherry tomatoes. 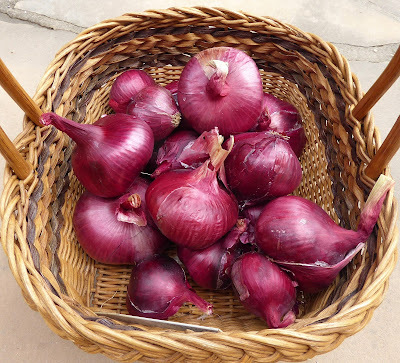 These little beauties are unique because they don't become soft when they ripen. 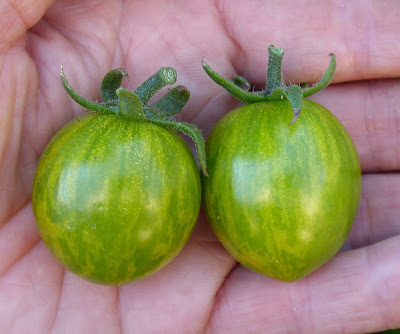 You can tell when they are ripe when the background color develops hints of yellow and/or pink, the unripe fruits are green on green. The first few bites were good! A few more Purple Bumblebee and Piccolo Dattero cherry tomatoes ripened, along with the first Jaune Flamme and Marzano Fire tomatoes. The Marzano Fire tomatoes are a striped paste tomato but they have a nice balance of sweetness and acidity that makes them a tasty slicing tomato too. We enjoyed one of the Marzano Fires long with most of the cherry tomatoes in a "Zoodle" dish inspired by a Vietnamese rice noodle salad. I used a few big Romanesco zucchinis to make spiralized noodles that I salted, rinsed, and then squeezed in a dish towel to remove excess moisture. Then I piled the uncooked zoodles in individual bowls, topped them with cut up tomatoes, sliced cucumber, thin sliced red onion, chopped cilantro and basil, chopped roasted salted peanuts, cold cooked shrimp, and dressed with a Vietnamese Nuoc Cham sauce (sugar, water, fish sauce, lime juice, garlic, chiles, shallot). Dave declared it a winner and said I should make it again so I guess I'll have to write up the recipe for my recipe blog. And now for the lineup of the usual suspects. Even though my kitchen project is still in process I manage to turn out a few good meals. I found that my 10-inch cast iron skillet fits perfectly in my toaster oven so I made a version of a Broccoli Raab Frittata using broccoli instead of the raab and substituting bacon for spicy Italian sausage and using only only 2 cheeses instead of 4. It came out great. I've also been relying on my Big Green Egg. The other night I grilled up a few of the Tromba squash, cut into about 8-inch lengths and sliced in half. I topped those with a mixture of sauteed ground lamb, onion, and dried sweet peppers seasoned with cumin, cinnamon, fennel pollen, pomegranate molasses, tomato puree, and cilantro. A cast iron skillet works well in the BGE for sautéing which is how I made the topping. That's the latest from my garden and kitchen. 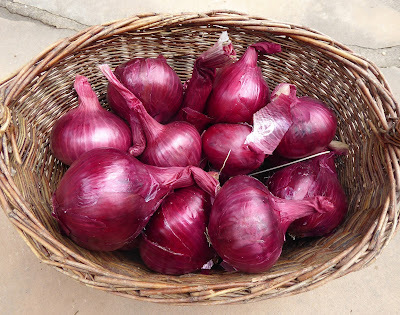 Harvest Monday is hosted by Dave on his blog Our Happy Acres, head on over there to see what other garden bloggers have been harvesting lately.